In Cabot's (the Princess Diaries) first foray into novels for kids who are still in single digits, her trademark frank humor makes for compulsive reading—as always. The first installment of a new series presents a nine-year-old girl attempting to impose rules for living on her increasingly complex world. 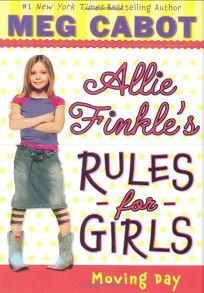 Allie is funny, believable and plucky (of course; all girls are plucky, at least in books), but most of all, and most interestingly, Allie is ambivalent. As the book starts, Allie learns that her family is moving across town. It is a mark of Cabot's insight to understand that, to a nine-year-old, a car ride's separation from the world she has known makes that distance as vast as the universe. Allie will be enrolled in a different elementary school, and will therefore be that most hideous thing: the new kid. To make matters worse, the Finkle family will be moving to a dark, old, creaky Victorian, which, Allie becomes convinced, has a zombie hand in the attic. Moving will mean leaving behind not only her geode collection but also her best friend. And here is where the story deepens. Allie's best friend is difficult. She cries easily and always insists on getting her own way. To keep the peace, Allie makes rules for herself, often after the fact, to teach herself such important friendship truisms as Don't Shove a Spatula Down Your Best Friend's Throat. Mary Kate is the kind of best friend anybody would want to shove a spatula down the throat of, is the thing. As Allie marshals her energies to fight the move in increasingly desperate ways, sophisticated readers may well conclude ahead of Allie that the friends she is meeting at the new school are more fun and better for her than spoiled Mary Kate and the cat-torturer, Brittany Hauser. Coming to this realization on their own, however, is part of the empowering fun. Told from the distinctive perspective of a good-hearted, impulsive, morally centered kid, this is a story that captures the conflicted feelings with which so many seemingly strong nine-year-olds struggle. Ambivalence is uncomfortable. It is also a sign of growing up. Early elementary school is all about primary colors, where rules, imposed by adults, are clear guidelines to good behavior and getting along. The more complex hues of the second half of elementary school, when complicated friendship dynamics begin to outpace the adult-imposed rules of home and school, leave many kids floundering and confused. In the character Allie Finkle, Cabot captures this moment of transition and makes it feel not just real, but also fun, and funny. Rachel Vail's forthcoming novel, Lucky (HarperTeen, May), is the start of a trilogy about three sisters.